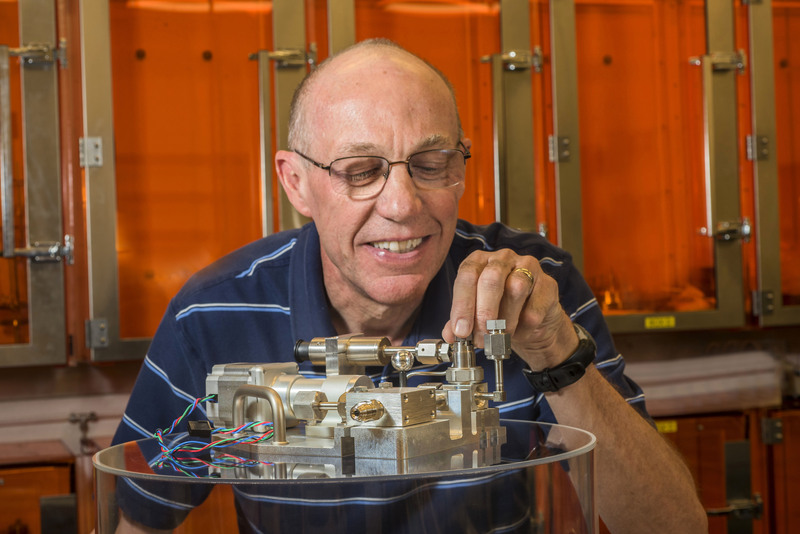 ALBUQUERQUE, N.M. — Researchers at Sandia National Laboratories Z Machine have opened a new chapter in their 20-year journey toward higher fusion outputs by introducing tritium, the most neutron-laden isotope of hydrogen, to their targets’ fuel. Sandia National Laboratories principal investigator Dean Rovang checks out the Z Machine’s tritium gas transfer system, which was built at the labs’ Livermore, California, site and filled with trace tritium (0.1 percent) at Sandia in Albuquerque. (Photo by Randy Montoya) Click on the thumbnail for a high-resolution image. When Z fires, its huge electromagnetic field crushes pre-warmed fuel, forcing it to fuse. Tritium-enriched fuel should release many more neutrons than previous maximums at Z, already among the highest in the world. “This thing about creating energy where none existed before — we don’t yet have a bonfire, but we’re squirting starter on the grill,” said Mike Cuneo, senior manager of Sandia’s Pulsed Power Accelerator Science and Technology group. The introduction of tritium is of high technical interest because a 50/50 mix of tritium and deuterium — the two isotopes of hydrogen — emits 80 times more neutrons, and 500 times more energy, than deuterium alone. Energy from deuterium — in a manner of speaking, a relatively low-octane fuel — has been the upper limit on output at Z. But it’s still early days. A dry run in July, testing containment hardware and instrumentation, preceded Z’s first tritium experiment three weeks later, when a fraction of a percent was cautiously introduced into the experiment’s fuel. Only two other Department of Energy-supported, high-energy-density research sites, at Lawrence Livermore National Laboratory and the Laboratory for Laser Energetics at the University of Rochester, had been approved to use tritium, a potential environmental hazard. The Sandia experiments use electromagnetics to smash Z’s more massive target and its entire target support area like they were hit by a sledgehammer. Unlike the laser facilities, the Z chamber must be entered by personnel after each experiment to refurbish the facility for the next experiment. Under those conditions, introducing tritium into the target requires extreme care and forethought in the design, transport and containment of tritium to meet rigorous safety standards. “Tritium’s like sand at the beach, it gets into everything,” said Cuneo. “So for now, we can’t let it go anywhere.” The isotope is a small molecule with a lot of mobility, and the first big hurdle, he says, is to make sure the radioactive material with its 12-year half-life doesn’t migrate to the million-gallon pools of water and oil that insulate Z’s pulsed power components. “Laser facilities don’t have these pools,” he pointed out. Tritium also could bond to the metal walls of Z’s central area, presenting a potential radioactive hazard where technicians enter daily to scrub after each shot. However, using the same unique design that has contained plutonium on more than a dozen previous Z shots, no tritium was released. 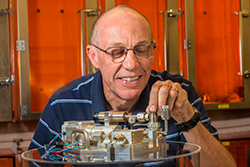 Nearly 100 Sandia personnel contributed directly to the effort, funded through Sandia’s Laboratory Directed Research and Development program. Also participating were researchers from General Atomics, Los Alamos National Laboratory, the University of New Mexico and Utah State University. Future work will be funded by the National Nuclear Security Administration (NNSA). Two fast neutron radiation-effects cassettes aim toward the center of the containment system for tritium within the Z vacuum chamber at Sandia National Laboratories. The setup’s gas transfer system is housed within the containment system. 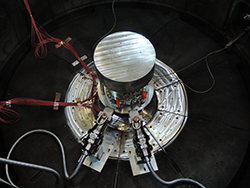 (Photo courtesy of Sandia National Laboratories) Click on the thumbnail for a high-resolution image. The team now must evaluate whether tritium can be used safely in uncontained experiments, their ultimate goal. Confined tests can evaluate the compatibility of tritium with Z’s materials and pressures, but don’t accurately measure fusion outputs. “The use of contained tritium on Z is the first step on this journey,” said Cuneo. “There is much more work to do. Uncontained experiments will begin with very small levels of tritium and gradually ramp up in a several-year process. 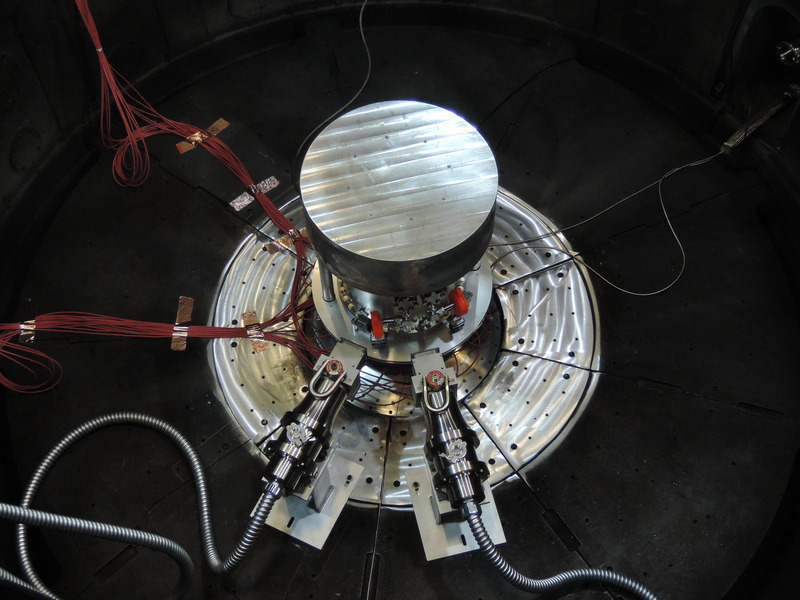 “We hope to find that we will able to safely handle 1-3 percent tritium in uncontained experiments, enough to advance Inertial Confinement Fusion applications, other weapons science applications and neutron effects testing,” Cuneo said. It will be at least three years before experiments approach the 50/50 mix of tritium and deuterium, depending on funding and Sandia and NNSA priorities for Z.